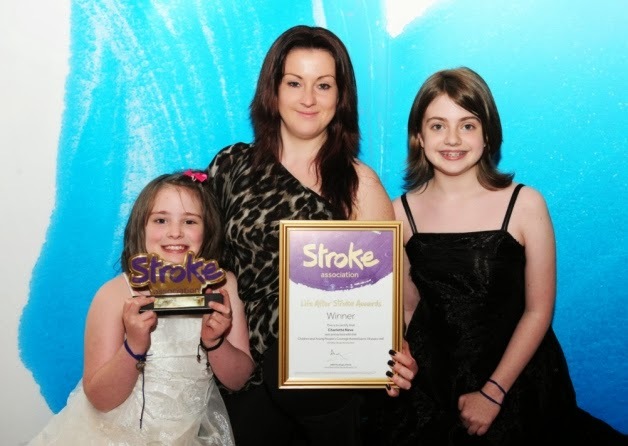 At the beginning of 2013, I was hunting around the Stroke Association website and saw that they run the Life After Stroke Awards annually which aims to recognise stroke survivors, their carers, fundraisers etc. and celebrate achievements and bravery. Whilst reading about the awards, reading through the categories and reading the stories of previous winners, I felt an overwhelming connection to them and what they had gone through and the goals they were striving to achieve. "Why don't you nominate Charlotte?" someone said ... not usually something I do but I was compelled to put Charlotte's story forward, not even with the thought of 'winning', Charlotte is my winner every day, but more with the intention of putting her story into the mix and again highlighting the fact that stroke DOES happen to children and so, I completed the nomination form. Previously, filling in forms to explain Charlotte's stroke and how it had affected her had always been such a draining, emotional and negative experience. Having to apply for disability aids, therapies etc. is so hard and something which goes against my need to look on the bright side and be positive. It is a dark and lonely experience to list all of your child's difficulties but ... I must say that filling in the nomination form for the Life After Stroke Awards, listing everything she had overcome, bragging, yes BRAGGING about how very brave she is and how gracious and inspirational she is made my heart swell with more pride than I imagined it could hold. That in itself was a fantastic opportunity. A few weeks later I got a call to say that Charlotte had won the Children & Young Persons Courage Award 2013 and we were invited to attend a star studded event at The Dorchester Hotel in London later in the year! I have limitless pride for both of my girls and never more so than I have been throughout this whole situation but there were definitely new limits attained on hearing this news! Charlotte's little face lit up when I told her the news, she couldn't grasp being given an award and still can't comprehend just how brave she's been and how much we're all inspired by her. Again, a lovely testament to how humble and genuine she is. So before the big event, we were asked to film a short piece for The Stroke Association to tell Charlotte's story and give our views on what we thought of her bravery. We involved Charlotte's aunties, cousins, Grandma, close family friends and of course her big sister. A film crew arrived at our house very early one morning consisting of The very gorgeous Millie and Declan from Media Spaces to catch our movements throughout the day; 'a day in the life of' if you will. This was a risk in itself as Charlotte can be fairly grumpy if she's woken up too early! The risk paid off though and she was great! She completely took all of the takes and re takes and talking about her ordeal in her stride - a real natural! Everyone was so patient and understanding with Charlotte and Megan and we had a great day filming and eating bacon butties. Yum! The time quickly went by and before we knew it we were on the train winging our way to London where a car was waiting to collect us and whisk us off to our hotel for the night. 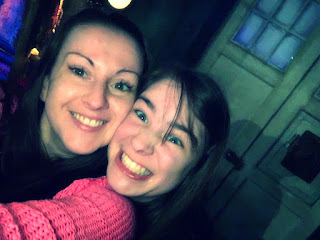 This was the first time the girls had been to London and what a first experience this was to be! We arrived at the hotel in Kensington and I for one was in awe at the ease at which the Stroke Association staff handled the amount of guests, rooms, disability needs etc.! Brilliant effort. We had time for a quick rest before getting ready to attend a scrummy dinner to meet all of the other amazing winners and their families and meet some of the staff who work so tirelessly to keep stroke awareness going and support as many stroke survivors as necessary. After our dinner, Charlotte was thoroughly exhausted so off we went to our room. Although she was tired, she was also very excited and so out came the audio books to try and get her to lie still and calm down. We chose to listen to the autobiography of my very favourite comedian, Lee Evans read by the man himself. I'm a huge Lee Evans fan, and a hue stand up comedy fan so it helped to take my mind off why we were there! So the big day arrived. We got up and it was all systems go with dresses, hair & make-up! I feel sorry for whoever had to clean our room after we checked out! The room was tidy and clean but they must have walked into the most dense cloud of hairspray ever recorded after 3 girls getting ready for an awards ceremony at The Dorchester! A car picked us up and took us across to The Dorchester where we were very well looked after. A glass of champagne was placed in my hand and was never empty (not for the want of trying let me tell you!). We met some lovely people at the drinks reception such as Radio 1's Greg James who was very gracious in giving his time to listen and learn about childhood strokes and the issues faced regarding treatment, after care etc. We found out that Daniel Roche who plays the youngest son, Ben in Outnumbered was to eat with us and present Charlotte with her award! Daniel was there with his Mum and both were so lovely. Megan and Daniel are roughly the same age so it was nice for them to have someone else other than all of us boring adults. 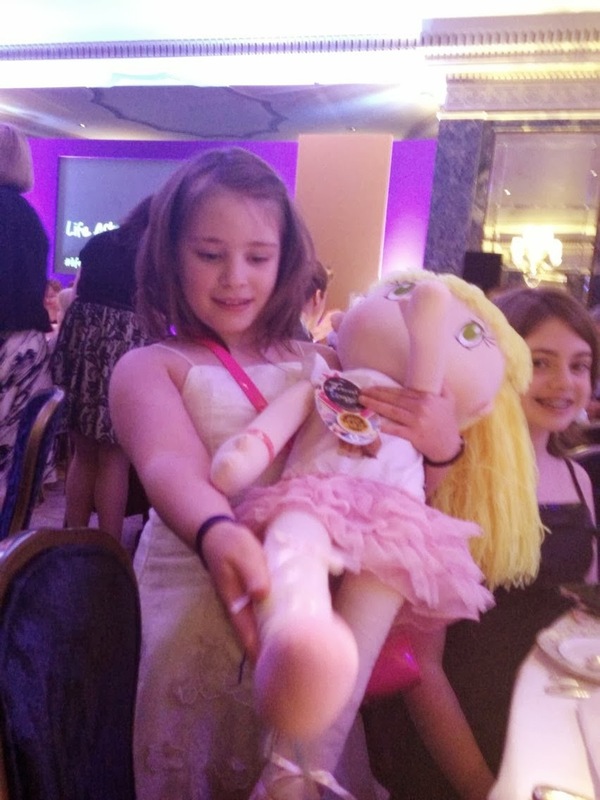 As we were shown to our table, we saw a beautiful goody bag which was left for Charlotte from Next, who were sponsoring her award, containing a pink satchel bag, lots of smellies and a huge doll which she cuddled throughout the whole event. The food was utterly stunning! We had a gorgeous mushroom risotto which nobody has managed to live up to since and the girls were made their very own chicken nuggets, Dorchester style! I'm sure they'll chuckle in later life at attending a dinner at The Dorchester and having chicken nuggets! The awards were kicked off by the stunning Karen Brady as we sat surrounded by Lords, Ladies, TV stars such as Ronnie Corbett and Christopher Biggins and even a real life Princess! We listened to everybody's stories and clapped until our hands hurt as the bravest, most inspirational people I have ever been privileged to meet took to the stage to accept their much deserved awards. I was very emotional and concentrating on these people but was aware that people at our table were moving around, I looked around thinking maybe there was a change to the running order and perhaps they needed Charlotte sooner. I have never been more surprised than I was when I looked around and there, grinning at me and saying hello to my daughters before joining us at our table was Lee Evans!!! THE LEE EVANS!!! The same Lee Evans who had read us to sleep the night before! He had heard about Charlotte and had wanted to come and be involved so had come along to co present her award with Daniel. He was great and we giggled and cracked jokes all the time he was there. I even made him crack up at one point which Megan says is my new claim to fame; I made Lee Evans 'LOL'. The time came for the Children & Young Person's Courage Award 2013 to be given. The film which was put together by Millie and Declan earlier in the year was played and there wasn't a dry eye in the house. I don't think we're hardened to adults going through illness but there's always something so shocking about a young child being seriously ill isn't there? A lot of stroke survivors didn't realise it could happen to children so that really highlighted the need for much more awareness of the subject. Daniel and Lee made a beautiful speech about Charlotte to accompany the film and as she stood up and walked up to the stage led by her big sister, Megan I thought my heart would burst! She received a standing ovation and got the biggest, loudest wall of cheers from us that has ever been heard. She managed to give a little speech which she had secretly been practising for weeks thanking everybody for coming and expressing her pride and happiness at winning the award. 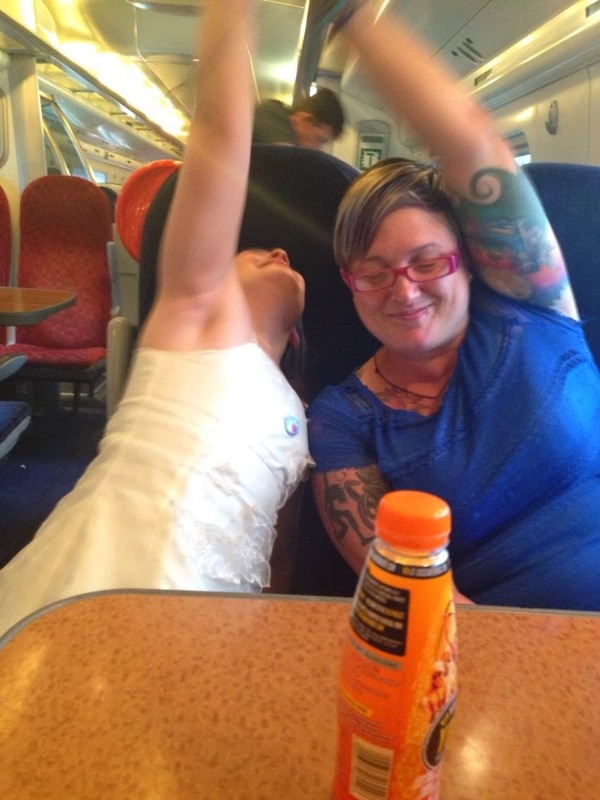 After the event it was time to get back up North so off to catch the train we went, still wearing all our finery and receiving lots of glances and smiles. It felt like a very long journey home and I don't think the events of the last couple of days had sunk in. We felt, and still do feel so lucky to be in the position we're in. It's easy for us to feel sorry for ourselves and I do struggle to contain my anger at the world for this at times but in its simplest form, we're all together and are in a very privileged position to try to help other people so to be involved and have Charlotte's bravery recognised was fantastic and very humbling.